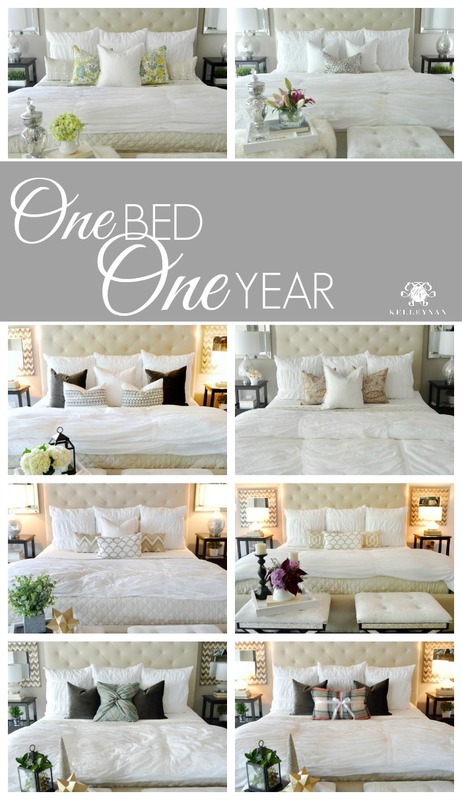 It’s been a little over a year since we moved into our home and in looking back at photos, if I didn’t know better, I would think that the number of bed transformations we have undergone outweighed the number of times we have taken out the trash. Not big changes… not crazy changes… just small, constant, refreshers. Some may think having a neutral bed is boring (I say this because I have actually read this more than once about our bed haha), but you know what I think is boring? Getting stuck with a vibrant design that limits your ability to trade out pillows and accent colors. After one year, I am sound in my decision to keep my bedding basics, well… basic. No accent pillows are off limits and no flowers will clash. 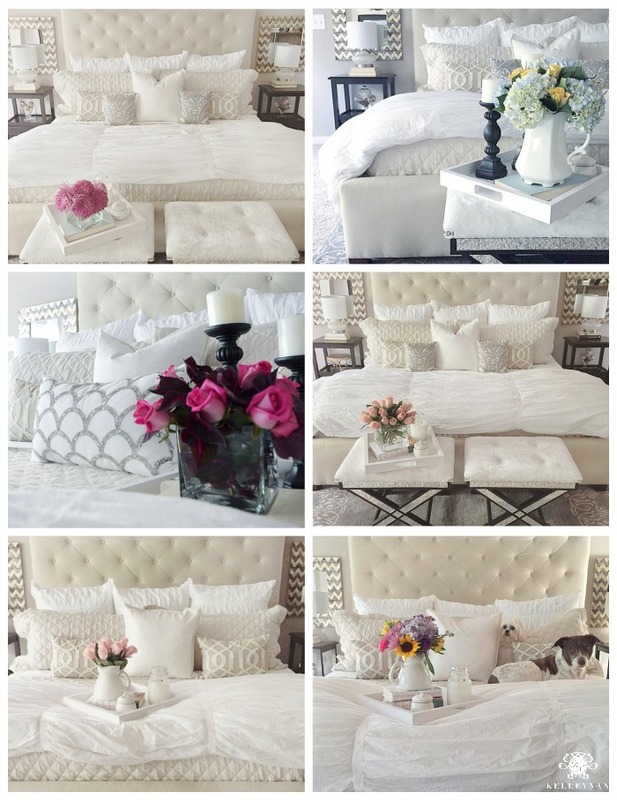 To give a little recap of what my master suite has seen, I have rounded up some of my favorite looks over the last year. Most recently, I hauled my cool, floral pillows up from the living room to give this space a dose of summer sunshine. I shared a few images of this look in my summer home tour a couple of weeks ago. Throughout the past year, the constants have been my 1. Lorraine Tufted Tall Bed & Headboard; 2. Hadley Ruched Duvet Cover & Euro Shams; and 3. Belgian Flax Linen Diamond Quilt. 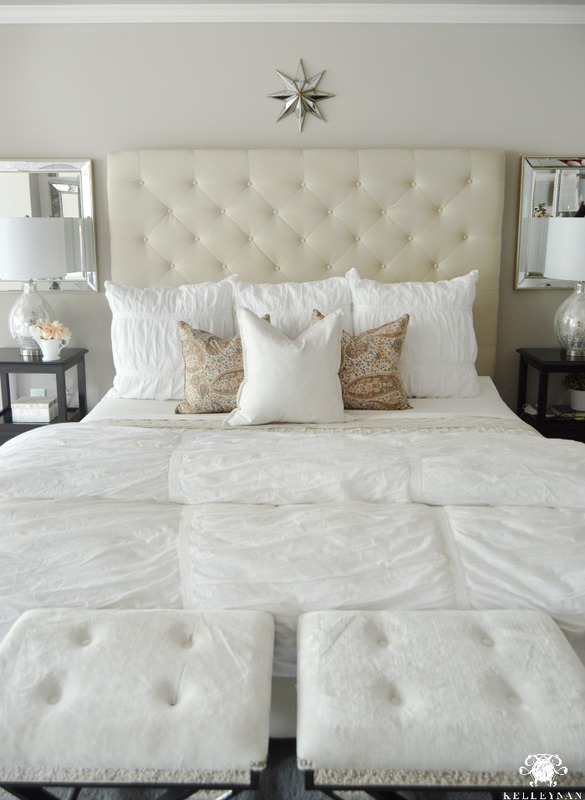 *The linen diamond quilt is my single most favorite bedding piece EVER. 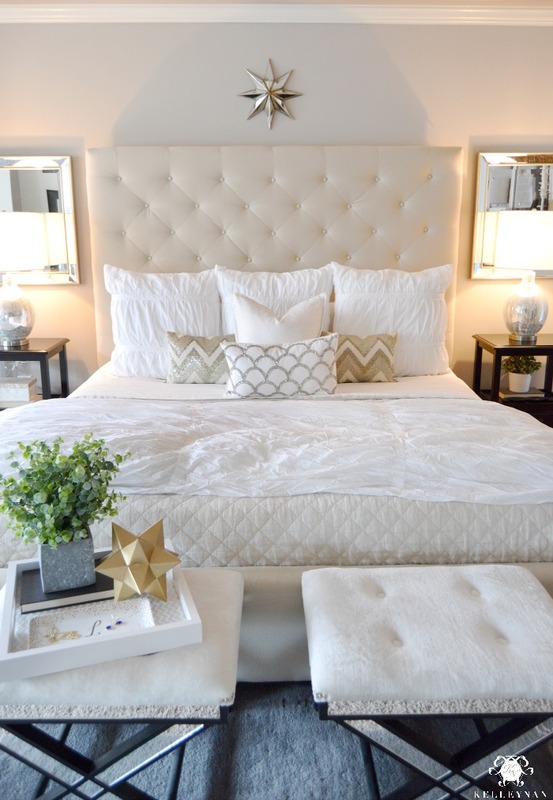 While we have it in our master bedroom in ‘Natural’, we have it in our guest bedroom in ‘White’. This look was just after I made a few small updates in the bedroom. 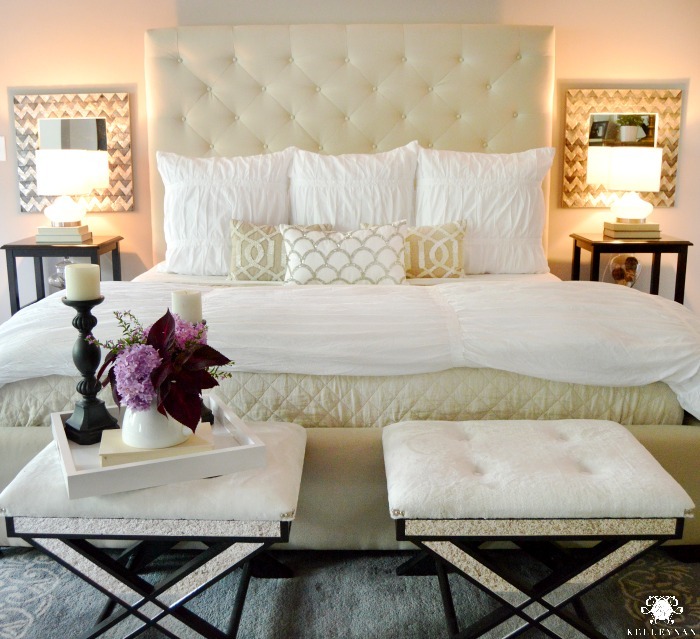 You can catch the details on the master bedroom refresh HERE. Following Christmas, I was so excited about thin strands of copper wire lights, I used some to outline my headboard to hang on to the season just a little longer. 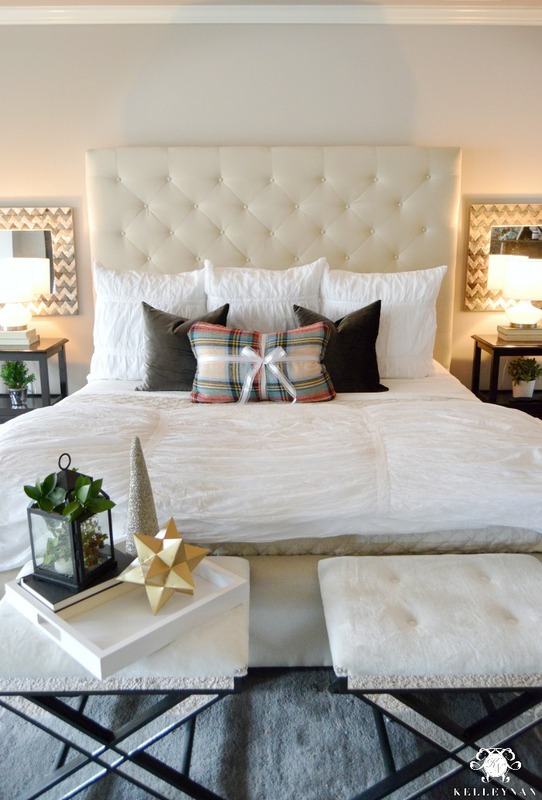 When I was decorating for Christmas, I wanted to find a way to incorporate cozy plaid into my bedroom decor. I came up with a way to easily transform some of my blanket scarves into pillow covers. You can catch the easy tutorial HERE. Here’s a different winter look using a similar technique. I love keeping all my bed neutral and only bringing some color in through flowers. Last fall, I was clipping my thriving coleus every week (it was out of control on my deck and I LOVED it) to accent my other blooms. More on that HERE. Here’s a few other looks over the course of the year. 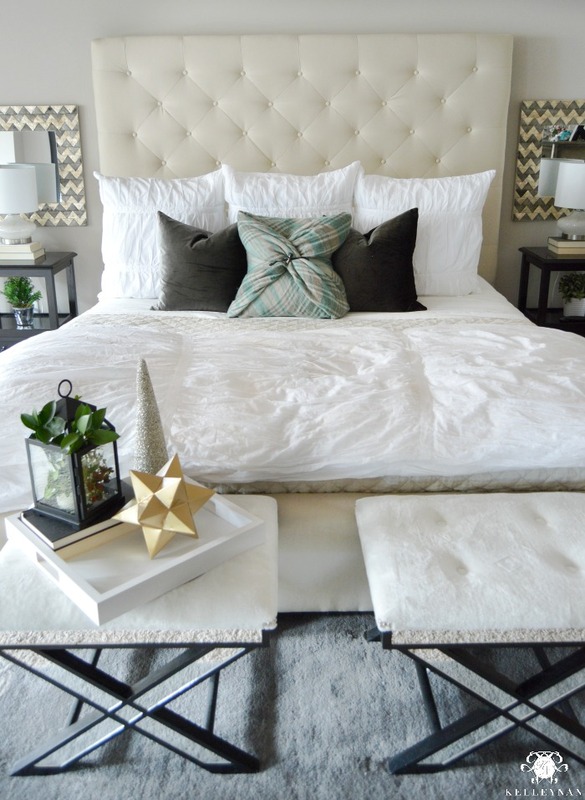 If you aren’t sure which direction you want to take your bedroom or you are looking for something you won’t easily tire of, go for the neutrals. I even have our guest bedrooms outfitted in neutral bedding (HERE and HERE). You may acquire one heck of an accent pillow collection (which may or may not later be known as your ‘closet of shame’), but it is an affordable and easy way to always have a fresh look in your bedroom. This is so fun kel!!! You are so good to switch things out! 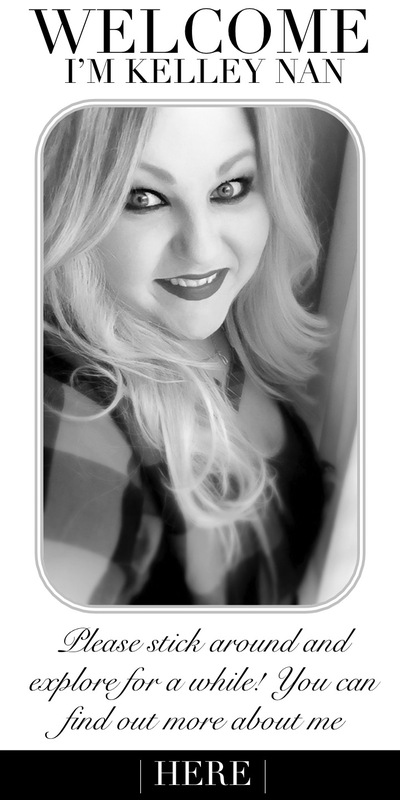 I get comfy with what I have and keep it forever! Hey Kelley! Love your bedroom? Where did you get your duvet from? Everytime i wash mine it scrunches up and isn’t as fluffy anymore, no body likes a flat pillow or bedding on their bed haha! 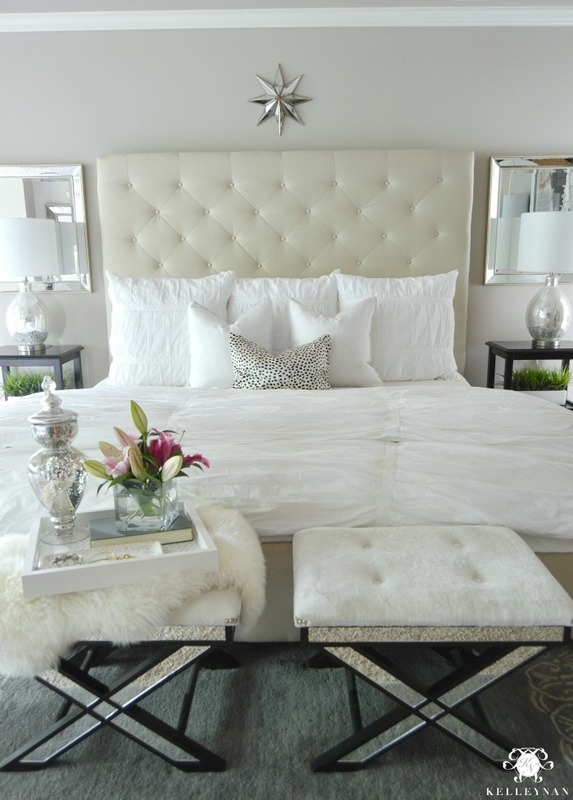 Which color/fabric is this Lorraine tufted headboard? I love the look of your bedroom. I’m getting ready to invest in the PB diamond linen quilt. I have the white Valerie matelasse duvet cover and wonder if you’d recommend getting a white or natural quilt. My bedroom is small with hardwood floors and a metal bed frame. Any advice appreciated. Susan, I have the natural in my master and white in the guest bedroom. I love both! Natural is super easy to keep clean but the white is so pretty. I will say, I tried the ivory and sent it back because it looked yellow. Does the natural look really brown or us that just the pottery barn webpage? I’m leaning towards the white but I wasn’t sure how dirty it would get. Hi, Anne! The natural is more of a taupe but a light taupe. Hi Kelley! Been debating on swapping out my PB Pickstitch quilt for the PB Belgian Flax linen diamond one that you have. I’m mainly concerned about softeness – sounds like you love it but I’d love more specifics from you if possible! Hi, Anya! Yes, I LOVE my PB linen quilts (I have 3 now). They are my favorite of all time- they wash so well and are SO soft (especially after the first wash). Plus, they are the perfect weight. If you have been considering one, I would go for it in a heartbeat. Let me know if/when you do and your thoughts!